"Hi, my streaming bundle 'La guitarra Mágica de Myrddin' offers you all my flamenco guitar classes including all sheet music, tabs, extra concert performances and interviews. Replay as often as you like anytime, anywhere, use for life". 6 VIDEO CHAPTERS (19 full screen HQ videos): Basic, intermediate and advanced techniques: alzapua in C, picado in A, picado in Am, tremolo in C, arpeggio in Am, legado, rasgueado in E, arpeggio in Em, pulgar in E phrygian. Compositions: Ama (Bulería), Osho (Soleá por Bulería), Calle Bolsa (Bulería). Extras. 81 A4 PAGES SHEET MUSIC AND TABS: All techniques, exercises and complete compositions: Ama (bulería), Osho (soleá por bulería) and Calle Bolsa (bulería). Myrddin, a technical virtuoso digging in deep emotions. Myrddin is a unique phenomenon in contemporary flamenco music. With his extraordinary interpretation of flamenco, merged with classical mu- sic and jazz, he moves every audience. His secret: technical virtuosity and harmony combined with deep emotions and sensitivity. After learning the flamenco fundaments from his father, Myrddin went to Spain to study with some of the greatest flamenco guitar maestros such as Gerardo Núñez in ‘94-’95-’96, Manolo Sanlúcar in ‘94-’95-’96, Enrique De Melchor in ‘95 and Rafael Riqueni in ‘95. After a while, Myrddin mastered a phenomenal, technical virtuosity but his primary concern remained to be the depth of music. 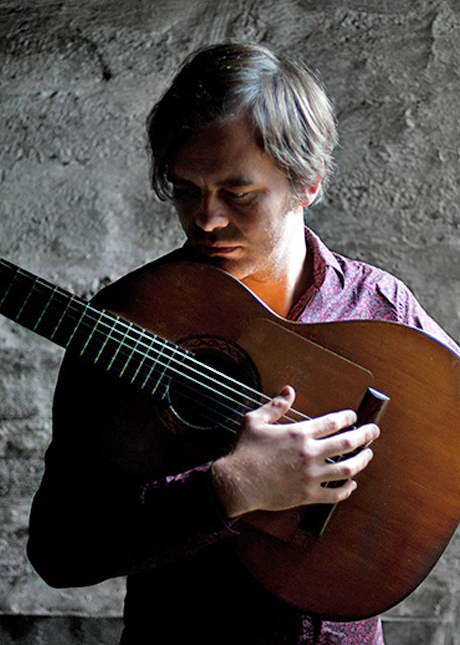 Due to his versatility of musical styles and his never ending hunger to dig deeper into music, Myrddin created his own original, unique style of contemporary flamenco. "Hello my name is Myrddin and I welcome you all here at the La Sonanta studios for my classes. We all know that the flamenco guitar is a very difficult style of music. I hope my classes will inspire you all and that you will find your own voice in the flamenco guitar. This is what I did all my life and will be doing…to find own things in the flamenco. Thank you!”.